What is the purpose of the Step-on Waste Bin? 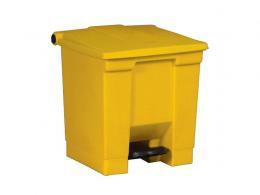 A step-on waste bin is a kind of waste container that doesn’t require the use of hands to open or close it. This is a type of disposal system that prevents spreading of bacteria. It has a tight-fitting lid that will prevent odours and other waste from leaking. The lids close gently to prevent unpleasant odour and other contaminants from being released into the air. Any property owner who wants to maintain a clean space and prevent cross contamination should have a step-on waste bin in their home or office. This is great for restaurants, clinics, offices, homes, and also public properties. Getting different colours will help with proper waste segregation. Step-on waste bins are great for kitchens or restaurants, where you especially do not want to lift off the waste bin lid by hand to avoid picking up potentially harmful bacteria from waste and transferring it to the food you are preparing. This is also useful for collecting waste from waste bins located in bathrooms. Cleaners or janitors do not have to use their hands to transfer contaminated waste to the large step-on waste bin. 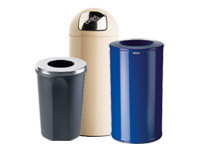 Clinics or hospitals that are handling infectious waste will also benefit from using these touchless waste containers. 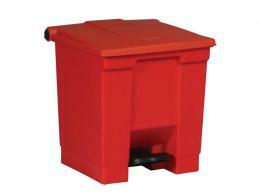 Workplace Depot’s step-on waste bin is a hands-free waste container, available in six large sizes. You can choose from a capacity of 30 litre through to a huge 87 litre unit. The Workplace Depot offers free delivery service and a one year warranty for this product. Order now and you will receive your step-on waste bin within 2-3 working days.